Pilates is a system of movement and exercise created and developed by German-born athlete and physical therapy pioneer, Joseph Hubertus Pilates. Utilizing his specially designed equipment, this innovative method educates, re-patterns, realigns, and balances your body. It promotes maximum muscle strength while increasing flexibility, coordination and stamina. Pilates also decompresses your joints and, consequently, stimulates and improves circulation. This enhanced circulation, combined with increased strength, range of motion, and a more balanced musculature, promotes healthy tissue and precise, efficient movement patterns. Re-educates correct posture from the powerhouse. Pilates slims muscles and makes them more compact, developing sleekness rather than bulk. It turns the abdomen and lower back and hips into a firm central support for a newly supple and graceful body. Whether Pilates is practiced in classes, on the mat, or with a trainer on the equipment, is considered a mind, body and spirit workout. The smooth motions and an emphasis on proper breathing, and use of the powerhouse leave participants feeling strong and refreshed. The exercises require concentration, control, precision, specific breathing patterns and dynamic, fluid movements. Deep abdominal muscles remain fully engaged during the workout, while torso, arm and leg movements are performed against body or spring resistance. 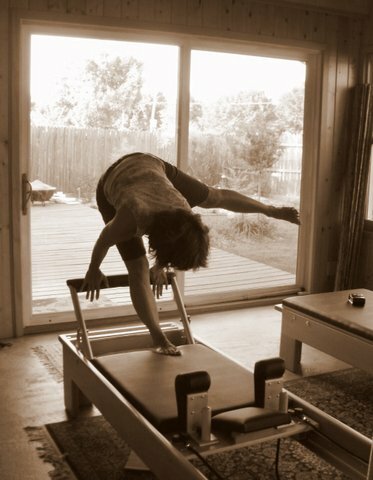 To make an appointment with Joyce, certified in Pilates mat work, reformer, Cadillac, and has also been a certified personal trainer for over 20 years, email ptpilates@yahoo.com or call 708-941-9340. Please leave a detailed message with your time availabilities and the specific training you need.